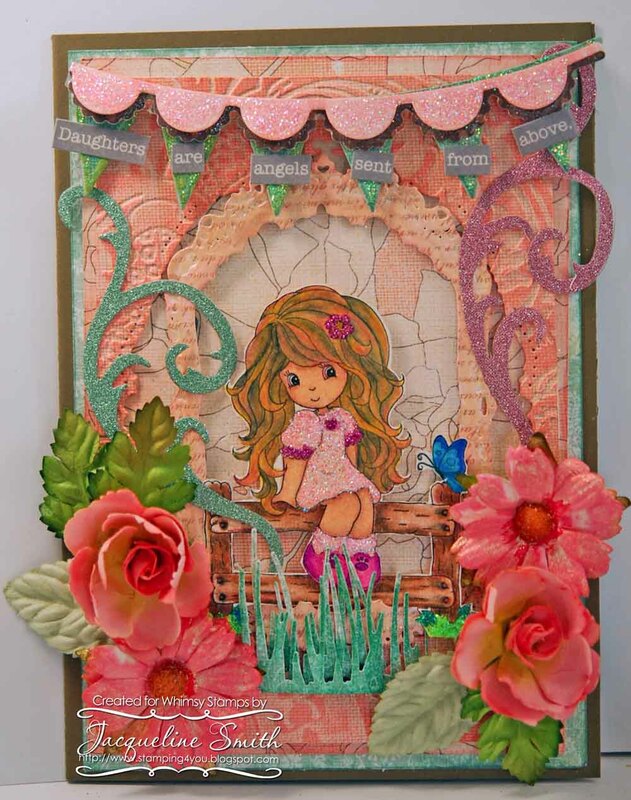 So here is my card for this week's April release by Whimsy Stamps. I used "Katie" by Kathryn Stamp Art Design. I colored her using Prismacolor pencils and added some Pretty Princess glitter to her hair and added Bubblegum glitter all by Sparkle N Sprinkle her socks and the dress. So I started off using Soft Suede paper as my base which is a 5"x 7" finished card size. I then used Authentique 'Grace' collection for the rest. I added 2 layers before adding a third layer which I had cut out using a Spellbinders 'Opulent Ovals' leaving a frame. I then ran the frame thru an embossing folder by Anna Griffin called 'Acanthus'. I then cut out another frame using Spellbinders 'Gold Label 4'. I sponge on some Rose Coral Fluid Chalk on both frames. I then sponged on some Banana Custard Smooch ink on the edges. I then laid in 'Katie' inside the frame. I then cut out grass using a Memory Box grass die and sponged on some green ink. 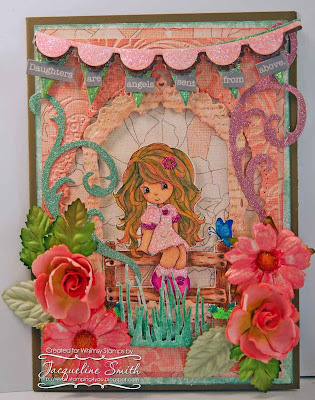 I cut out 2 flourishes using pink & green glitter paper using Tim Holtz 'Elegant Flourishes' die. I then cut out the banner using a Spellbinders die made exclusively for JustRite using different papers from the Grace collection. I then used a sticker from the same collection for the sentiment. I added some salmon colored flowers and leaves by Prima Marketing. I added 2 white daisies flowers by I Am Roses and sprayed them using Lindy's Stamp Gang Starburst spray called Alpine Ice Rose Primrose. The hop will run for 1 week and end on Monday 8th April at 12 Noon EST, when the lucky winners will be announced right here. Gorgeous Card. The image is so cute and you have coloured it in wonderfully. The layout of the scene is really nice and the embellishments are really pretty. oh, I love the colors and all those flowers are wowzers! Awesome card! What a cute image - great job as always on all the fabulous elements! WOW!! Such a beautiful detailed card!! That Katie is adorable! WOW! This is so beautiful. Great coloring and so much to look at! That image is such a cute little girl. You created a great card! What a sweet card! The colors are perfect for a girl! Ohhh my Goodness, how stinkin' cute! And SOOO Much detail. I absolutely love it. She really is a little sweetie. You did such a beautiful job with her. Cute card. I've never seen one done by using pencils before. I will have to try that.